It’s an abomination that Victor Frankenstein would be proud of. If the parts are put together incorrectly, much like Victor’s early efforts, it will die, a quick and horrible death. It is, of course, poor CV grammar and the incorrect use of they’re, their and there. To make this quick and easy to understand I have put together some simple examples of how the words should be used. 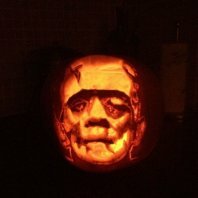 I have also put some links at the bottom of the article for those of you that would like to learn more and even a link to the template that I used yesterday to create the Frankenstein pumpkin carving in the picture! They’re: A contraction of: they are. Usage: They’re going to the cinema. If they’re about to order food. Their: A pronoun and not the same as they’re. Usage: It was their car. The board will meet with you but it will be at their convenience. There: An adverb and not the same as their. Usage: Your CV is on the desk over there. When you get there. It is there. These three words are regularly confused and can have the same damaging effect (not affect! I will cover this later.) as poor spelling. If you find yourself forgetting which word you should use then please bookmark this page and refer back to it when you wish.